Shares in HMV rose as much as 17%, after the retailer said it had a "really cracking Christmas" period. 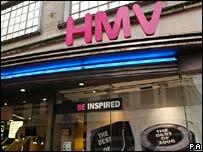 HMV said like-for-like sales, which strip out the impact of new store openings, rose 9.4% across the group in the five weeks to 5 January. The music and books firm said like-for-like sales in the UK and Ireland rose 14.1%, while sales at its Waterstone's bookstore chain added 4%. HMV said it expected full-year profits to be at the top end of forecasts. By the close of trade on the London Stock Exchange, the shares had given back some of their gains and ended 3.96% higher at 105 pence. In 2007, HMV began a three-year programme to turn around the business, after being hit by falling profits. The firm - which operates 422 HMV stores worldwide and 323 Waterstone's outlets - has come up against strong competition from supermarkets and music downloads. However, HMV chief executive Simon Fox said the firm had enjoyed a "really cracking Christmas" with strong demand for DVDs and computer games. Top-selling DVDs over Christmas included The Simpsons Movie, the Bourne Ultimatum and High School Musical 2. Waterstone's saw strong sales of books by Nigella Lawson, Jamie Oliver and Jeremy Clarkson, and sales at its internet site doubled. Did you stick to festive budget?